Excavation of two quarries in Wales by archaeologists and geologists from a number of organisations, including the University of Southampton, has confirmed they are the sources of Stonehenge’s standing ‘bluestones’. 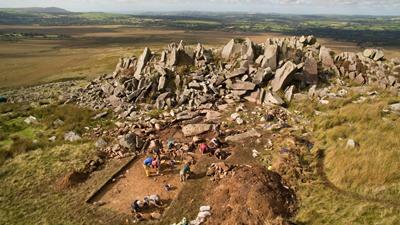 The discovery, published today in Antiquity, presents detailed evidence of prehistoric quarrying of the bluestones in the Preseli Hills within the Pembrokeshire Coast National Park in west Wales. The research also sheds light on how the stones may have been transported to the Stonehenge site some 170 miles away in Wiltshire. The megalith quarries are on the north side of the Preseli Hills, which potentially challenges previous theories about how the bluestones may have been transported from Wales to Stonehenge. Previous writers have often suggested that bluestones were taken southwards from the Hills to Milford Haven and then floated on boats or rafts. The very large standing stones at Stonehenge are of ‘sarsen’, a local sandstone, but the smaller ones, known as ‘bluestones’, come from the Preseli Hills. Geologists have known since the 1920s that the bluestones were brought to Stonehenge from somewhere in the Preseli Hills, but only now has there been collaboration with archaeologists to locate and excavate the actual quarries from which they came. The project, led by University College London (UCL), includes experts from Southampton, Manchester and Bournemouth universities, Amgueddfa Cymru – National Museum Wales, and Dyfed Archaeological Trust. 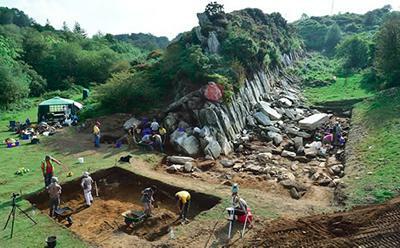 Funding for the excavations has come from the National Geographic Society, the Society of Antiquaries of London, the Royal Archaeological Institute, the National Museum of Wales and the Cambrian Archaeological Association with support from the Pembrokeshire Coast National Park.